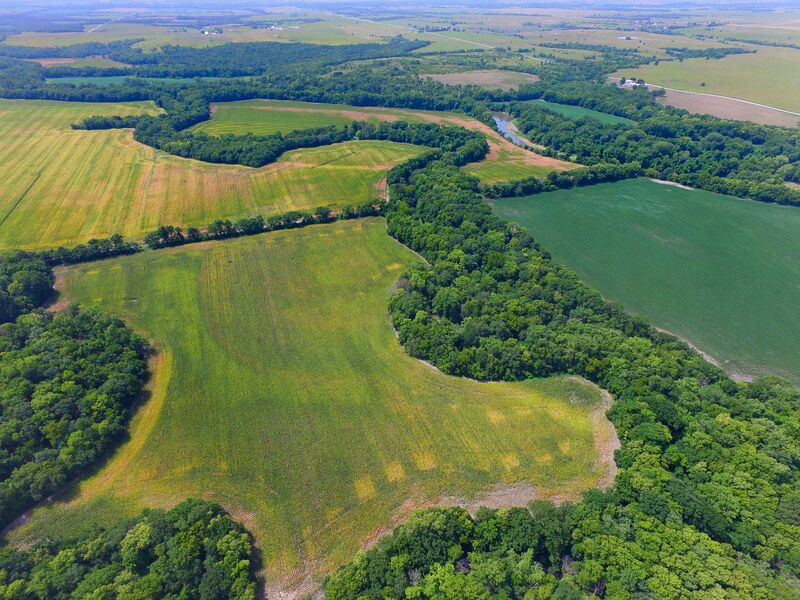 This excellent Neosho River Valley parcel has been in the same hands for decades and once it sells, will likely be in those hands for decades more. This is the type of parcel you buy and hold on to! Acreage total is 160 more or less with 112 acres in high quality cropland. The majority of soils are comprised of Verdigris silt loam and Osage silty clay loam. The balance of the property is hardwood timber that flanks Wolf Creek as it meanders through from east to west. Deer, turkey and quail hunters will want to take a look at this top-shelf hunting property. This parcel is ideally set up with multiple access points depending on wind direction, lots of privacy due to lack of homes and a dead-end road, multiple good bedding areas, mature hardwoods and plenty of food from the crop fields. This property is being offered via private bid sale with bids due on April 16th, 2019 by 2:00 P.M. Contact Cameron Roth at 620.888.3040 for terms and conditions or to order an informational packet on the sale. The sellers have reasonable expectations aren’t just testing the market. Come prepared to buy! Tenancy and Possession: This property sells subject to a tillable lease for a Spring of 2019 soybean crop. The Buyer will receive a 1/3rd share of the soybean crop and be responsible for 1/3rd of the chemical cost which has been estimated by the tenant at approximately $4,030.00. Full possession of the tillable portions of the property will transfer after harvest of the Spring planted 2019 soybean crop. Access: In past years, the south tillable field containing 24.73 acres has been accessed by crossing Wolf Creek. In recent years, the neighbor, Kenny Nelson has been kind enough to allow access from a road on his adjoining property. There is no easement, but Kenny has verbally indicated he is willing to continue this arrangement with the new owner. This will need to be worked out between the Buyer and Mr. Nelson. Vaughn-Roth Land Brokers makes no guarantees of any kind regarding this relationship going forward. If you would like to visit with Mr. Nelson about this subject, please give us a call for his contact information. Driving Directions: From Burlington: Take Neosho St east out of Burlington, following curves for 2.25 miles to Oxen Road and turn south. Follow for 1.5 miles and property begins on west side.